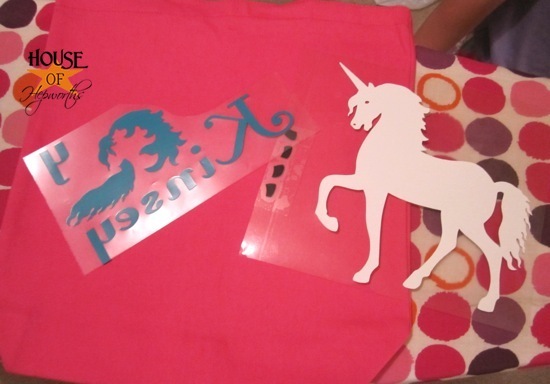 Check out these fun heat transfer projects I made this weekend. I ended up making 4 projects because I couldn’t decide on just one! Each of my children got a new shirt! I also wanted to create something that wasn’t just a basic t-shirt to show you guys how much this little machine really can make, so I whipped up these bags for my kids to carry their piano music in. Both kids take piano lessons each week and desperately needed a bag to carry all the books in (they each have 4 piano books plus a lesson plan book). I purchased the canvas bags at Hobby Lobby then used images from the Silhouette Store to iron onto the bags. Kinsey’s bag required the most work but was still easy to make. 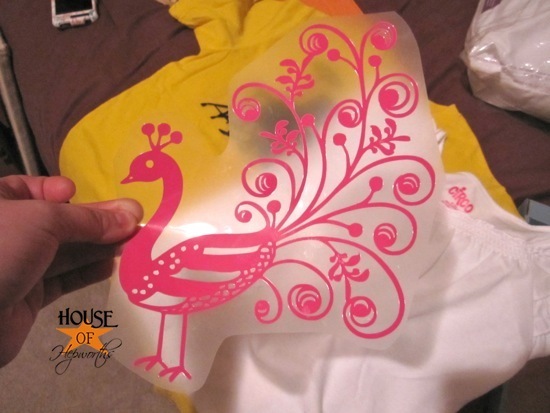 All you do is cut out your pieces in the appropriate colored heat transfer material, then iron on one layer at a time. I really like finding ways to layer the heat transfer to create an image with multiple colors. The body of the unicorn was actually done in a white glitter heat transfer material, which does not come in the basic kit mentioned above. Isn’t it so cool?! 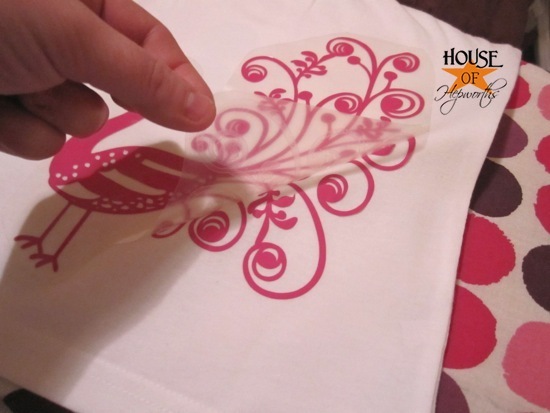 Using the Heat Transfer Material is so easy! 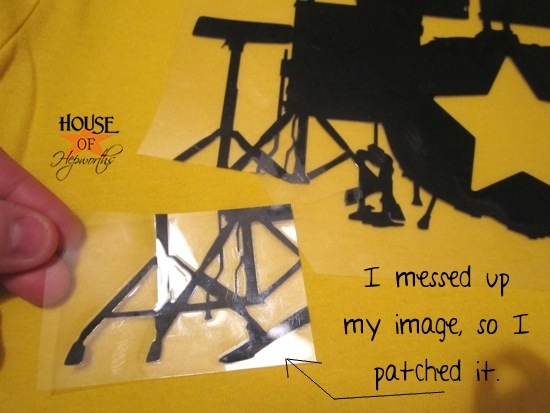 All you do is cut out your images using your Silhouette CAMEO (make sure to mirror your image before cutting b/c you are cutting on the reverse side of the material). Then you lay your image on whatever surface you are adhering it to. In this case I’m applying it to a cute ruffle shirt I found at Target. Next you cover the heat transfer material with a towel or fabric and iron it for several seconds. When you are done ironing, peel the plastic backing off the heat transfer. Voila. You are done! Because of a user error (ie I’m an idiot!) I ruined part of Travis’s drum set heat transfer. I didn’t want to waste almost an entire sheet of heat transfer so I made a small “patch” to fix the ruined section. After ironing it on top of the other image you can’t even tell it’s patched. The moral of the story? If you screw up, it’s okay to patch it instead of throwing away an entire sheet of heat transfer material. You can see all the other projects I’ve made using my Silhouette by clicking this link. « Oh, just put your sticks in it already. I am a Pinterest and Silhouette blog follower! I follow them on pinterest as well as their blog. I am following Silhouette’s blog – great projects Allison! I already follow Silhouette of Pinterest. I drool over all the things I would do if I had a cutter. I may never leave my craft room if I got one! I pinned an image also! Thanks! I followed the pins and pinned your post! I pinned the picture of the bags. You could make a bag for anything, dance, piano, coloring books… Oh, so many ideas! I really hope I win this badboy! I follow Silhouette through the blog and on Pinterest. Pinned hibiscus pillow on Pinterest…..I ♥ that pillow! Darn… I live in Canada. Started following both of you on Pinterest 🙂 YAY! I am now following them on Pinterest! I pinned this on Pinterest! I love me some HoH! I pinned your post on pinterest! Following on pinterest! Saving to buy if I don’t win! I repinned the peacock shirt on Pinterest! I follow Silhouette’s blog and Pinterest! I follow silhouette on their blog! I just started following your blog and Silhouette’s blog. I am following them on Pinterest too! Would LOVE to have this unique tool in my sewing/craft room! Thanks for all the wonderful ideas and for the phenomenal giveaway! I pinned this to enter the giveaway. The peacock and piano bag are SO cute! I pinned Kinsey’s shirt on Pinterest! My dauther would LOVE if I made her a shirt or a bag…or both!!! I now follow silhouette on pinterest! Great blog!! I follow Silhouette on Pintrest AND their blog. 🙂 I want a Cameo sooo bad. Thanks for the awesome giveaway! I have been wanting one of these, i am following on Pinterest!!!! I pinned the drum set shirt on Pinterest! I am a follower of Silhouette on Pinterest 🙂 Thanks for the chance! I pinned the hibiscus pillow! What a great idea! I would love to win a Cameo! Pinned this! What a great giveaway! I follow Silhoutte on their blog. Looking forward to learning more great ideas and I would LOVE to have this machine!!! I pinned a pic on Pinterest! i follow them on facebook and pinterest!! i love everything that you can make with the machine!! i also pinned the picture of the unicorn bag! I also pinned that adorable piano bag!! <3 it! Love this!! If I don’t win I just have to buy one! Oh, the “things” I could create…. (DREAMING) Following on Pintrest and the blog! Love you blog! Last night we laid in bed laughing (hubby and me) about the soap dish in the shower you took off (and put back)! Funny!! I follow Silhouette (and YOU) on Pinterest! I follow Silhouette both on Pinterest and their blog! I follow Silhouette on Pinterest and their blog. I also ‘pinned’ image from this post. I follow you & Silhouette on Pinterest and had already pinned the peacock shirt <3. Thanks for all your wonderful ideas! I pinned a picture on Pinterest! I’m following Silhouette on Pinterest!! I follow their blog. Love your heat transfer projects! Your projects turned out awesome. On many of the blogs I follow I see so many wonderful projects using the Silhouette and it makes me want one so bad. I would do cartwheels if I was the winner. thanks for the opportunity. I am now a follower on the Silhouette Blog. I follow Silhouette on their blog & pinterest. I also pinned an image from this page to my pinterest! I repinned the peacock shirt and the piano bags! Cute! I actually already follow silhouette on pintrest AND their blog! 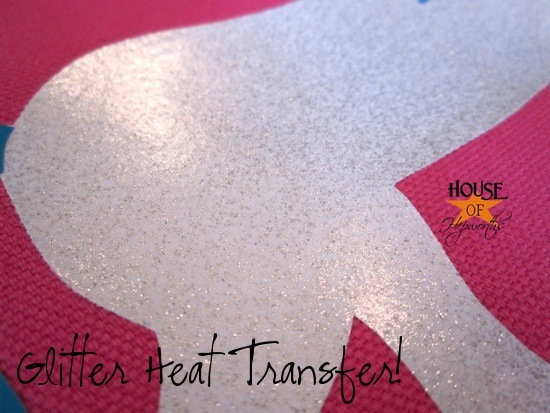 I would LOVE to try out the heat transfer stuff! I follow Silhouette on Pinterest! I hope I win!!! I repinned the Hibiscus pillow on Pinterest! Thanks for the chance to win! I follow them on Pinterest!!! I REALLY would love to win this!!! I pinned the peacock shirt on Pinterest! I hope I win so I can make one too! Fingers crossed!!! I also pinned an image! following Silhouette America on Pinterest! Ohhhh I soooooo want to win! How fun! I follow silhouette on pinterest! I Pinned those adorable pillows with the Hibiscus flower on it. Love it!!! I am following them on Pintrest and on their blog. Thanks lets hope I win! I follow silhouette via Pinterest and follow their blog via RSS! peacock pinned and Silhouette followed! I follow the Silhouette blog and their Pinterest boards! I pinned the glitter transfer paper. That’s really cool. Would LOVE to win a Silhouette! I follow their blog. I am so excited for a change to win this Silhouette! I have so many ideas!! I also pinned the hibiscus pillow—so cute, love the flower and the color! I follow Silhouette on both Pinterest and their blog! I pinned this giveaway on Pinterest. I’m a follower to Silhouette on Pinterest and I follow their blog too! Pinned your “fix” pic on Pinterest. Don’t get me wrong, I think your t-shirts are great, but no one ever talks about how easy it can be ti fix a boo-boo. THANKS for that! I’m following their blog and I think I’m going to find them on Pinterest too! Awesome stuff. I pinned the peacock shirt! Adorable! I’m a Pintrest follower of Silhouette! I think I follow them on their blog. I logged into fb and went to their blog so I think I am on but I declare things are changing so fast I can’t keep up! Thanks for the chance to win! I pinned this giveaway on Pinterest! I do want to say that I LOVE that peacock shirt and I love that my girls can help me with it too! Thanks so much for the giveaway! i pinned the image of the piano bag & hope i get a chance to make one! i follow their pinterest boards! Love your work. I would love to be entered. I am now following Silhouette on Pinterest and have repined a photo from the post. I follow Silhouette on FB, Pinterest, and their blog! I just pinned a pic from the contest! I pinned the image of the piano bag on Pinterest. It is ADORABLE. As a piano teacher I wish all my students had a cute bag like this to bring to piano and keep their books together. Maybe they’d even practice. All your projects are so cute. I follow Silhouette on Pinterest and their Blog. I follow Silhouette on Pinterest and their blog! LOVE LOVE the hibiscus and the blue color on the pillow! I follow Silhouette. THanks for the chance!!!! I am a follower of the Silhouette Blog and Pinterest. I love Silhouette! I repinned the Peacock Shirt. That is adorable! I follow Silhouette’s blog under the name macintosh603. Fingers crossed! I am following their blog! Thanks!! I love this machine!I followSilhouette on Pinterest. I pinned the hibiscus pillows on Pinterest. & I pinned your hibiscus pillow. Didn’t even know Silhouette was on Pinterest! Just added them to my “follow” list! I already follow Silhouette on Pinterest because I want one so badly! Just pinned your giveaway on Pinterest! Thanks!! I may have reposted twice if i did i do apologize. I really love all the things you have made with the silhouette and/or cameo. I think my favorite it the piano and the unicorn bags. Thanks for a great giveaway! I follow Silhouette America on Pinterest! I am following the Silhouette blog. Great product….looks like fun. I did repin your post onto my pintrest about the giveaway. 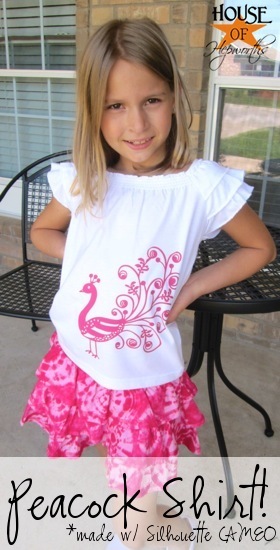 I pinned the cute pink peacock shirt to Pinterest. You have created some amazing projects….so personable…. 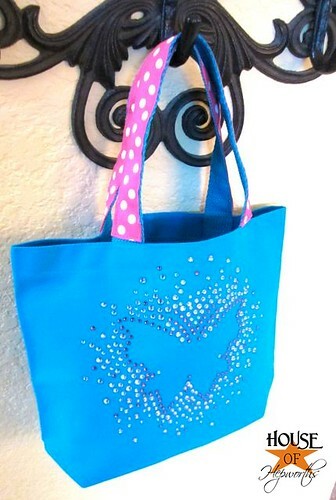 I “pinned”: the too cute rhinestone bag. I am following Silhouette’s blog!! I followed them on Pinterest! Hope I win, this looks so fun! I also repined their chalkboard labels. I pinned one of your Silhouette projects. Happy Monday! Thanks for the opportunity to win a Silhouette. I would love to have one. I follow Silhouette on Pinterest! I follow Silhouete on both Pinterest and their blog. I pinned the darling pink peacock onto my Pinterest page. I pinned Kinsey’s super adorable peacock shirt!!! I’m following Silhouette on Pinterest AND their blog! I’ve pinned one of your projects to Pinterest, too! And OMG is your page so cute! I am going to be your newest follower! SUPER CUTE!! I follow Silhouette on Ponterest! I follow you on pintrest, and I love your blog!! I pinned your hibiscus pillow…it’s so cute! I follow Silhouette on Pinterest & their blog! I am followning Silhouette on pinterest, and I pinned this on my pinterest! I pinned the drum set shirt. Pinned the peacock design…love it! I follow the silhouette blog. I’m new to your site but I have to say I love the black and white piano bag. I may just have to make one myself. I follow Silhouette on Pinterest! Thanks for the chance to win! Would just love to win. I have invested a fortune in the Cricut, but it’s just not doing the things my heart desires. I have just started my own home business and I know the Silhouette would give me the jump start I need. My hubby is just recoving from cancer, so with medical bills I just can’t go out and buy one. I pray I am lucky enough to win. I am following on Pinterest, Facebook and other things required to enter. Thank you so much for such a great giveaway!! pinksurvivor03 at gmail dot com. I just started following Silhouette on Pinterest. I would love to upgrade to a Silhouette from my Cricut Expression. Thanks for the chance to win, Allison. I pinned this post and i follow silhouette on pinterest! I follow their blog and on pinterest! Thanks for the give-away! I pinned an image too! I love the piano bags! I’ve been dying to get one of these! Pinned your post and started following Silhouette on pinterest. keeping my fingers crossed! I am already following Silhouette on both their blog and Pinterest page! I follow silhouette’s blog, would love a cameo. I follow Silhouette’s blog and on Pinterest! Thank you! I pinned the drum set shirt image to Pinterest! I follow Silhouette on Pinterest and their blog, love them! I pinned about your giveaway! I follow Silhouette on their blog. I want one of these so bad, wish me luck! i follow them on pinterest and their blog! Thanks for the giveaway! i follow them on pinterest! thanks for the chance to win! I’m following on Pinterest, my newest addiction. Please enter me in your lovely giveaway. Thank you. I pinned your pillow project! so cute! I follow Silhouette on Pinterest and I am a follower of their blog! I follow Silhouette on Pinterest AND on their BLOG. I would LOVE to win the Silhouette Cameo because I could cut absolutely ANY design I can think up. I am a teacher for students with physical disabilities and other health impairments and we are always looking for ways to fund raise for field trips and outings. With a Cameo, we could create tee shirts, decorate candles, bag tops and lollipop tags for holiday sales, cards and calendars and bulletin boards and… I could go on forever! What a treat it would be for us. And NO CARTRIDGES to buy! Thanks so much for the chance. Fingers crossed. I actually follow Silhouette on FB and their Blog and on pinterest! I love these guys! I follow the Silhouette Blog already and would love to be the one chosen. Thanks for this opportunity. BTW – I don’t know how to “pin”, and I’m not on facebook. I follow Silhouette’s blog and Pinterest!! but I need to be invited on Pinterest to pin am I right? I adore all your works, I’d like to make something so beautiful for my little girl Anna (she’s 2 on May) this means I have several years to work for her ^^) and I like it! I follow Silhouette on Pinterest and on their blog! I pinned your hibiscus pillow! Love it! I follow Silhouette on Pinterest and their blog! Thanks for the chance! I follow the Silhouette blog and I follow Silhouette on Pinterest. Following on pinterest! Thanks for the giveaway! I pinned your pillow on my Perfect Pillows board. Love it! I follow them on pinterest! Such a fun giveaway! I pinned! Thanks for the opportunity! I pinned a picture of the peacock transfer. So cute!! Oh, pick me! I love following you AND Silhouette on Pinterest. I want one of these so bad. No money! I pinned the peacock shirt on Pinterest! I follow Silhouette on Pinterest and FB. I follow Silhouette on their blog AND on Pinterest! I pinned an image to Pinterest! I followed Silhouette on Pintrest! I follow Silhouette on pinterest. Thanks so much for this rockin’ giveaway! Pinned the Piano bag! I need to make one of these for my daughter! I pinned the peacock shirt. My daughter would LOVE IT! 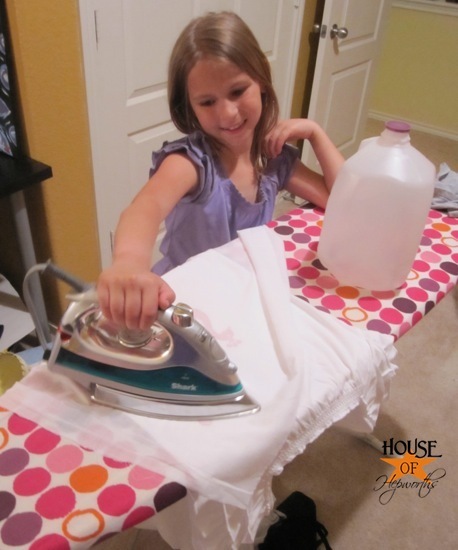 I have pinned the Blue Hibiscus pillows, but really wanted to pin the happy ironing girl. I am now following Silhouette on Pinterest! And now I have so many ideas! I follow Silhouette blog. My daughter would love the peacock shirt. So cute! I pinned your Hibiscus Pillow! I follow Silhouette on their blog! What an awesome giveaway! I follow Silhouette on Pinterest & follow their blog. I follow Sihouette on Pinterest! I follow Silhouette on Pinterest. I follow your blog! LOVE LOVE! I also “pinned” this Page. I follow their blog and on Pinterest. Pinned your cutie patootie hibiscus pillows! The Peacock shirt is A*D*O*R*A*B*L*E! Thanks for the opportunity to win a Cameo! I follow Silhouette on Pinterest. I pinned the peacock transfer image from this post. Its so pretty and could be used for shirts, accessories or even decoration. I have to say its a million times cooler than the giant bear iron on my mom slapped on my tee when I was Kinsey’s age. I follow Silhouette through Pinterest and their blog. Thanks for this amazing giveaway!! I pinned the Peacock shirt & giveaway on Pinterest. I also pinned an image from this tutorial 😀 #2 entry!!!!!! I hope I win!!! Following on Pinterest and on the Silhouette Blog! I followed their blog…AND….I really NEED a silhouette in my life!! I pinned the hibiscus pillow onto Pinterest. I follow both the Silhouette blog and on pinterest. I follow Silhouette on Pinterest and get their blog. I pinned your cute pillows! I pinned that adorable Peacock shirt. Thanks for this amazing giveaway! I would love love love love love LOVE to win this! I am hoping and praying that I will win. I just will use it for absolutely EVERYTHING! I am also following silhouette on their blog and on pinterest! I also pinned an image about this giveaway on my pinterest! I pinned and followed silhouette both ways! I follow Silhouette on Pinterest and their blog! Thanks for the giveaway! I follow Silhouette’s blog and follow them on pinterest. <3 the cameo. I hope I win. I followed them on Pinterest, and I desperately need this machine!!! I follow Silhouette on Pinterest and have a stockpile of ideas to create if I win the Cameo! I’m new to sewing and bought some fabric to make curtains for my master bedroom. I would put the heat transfer on my newly sewn curtains to create a cool damask pattern along the bottom. I would love to win this Silhouette!!! I follow the Silhouette Blog via Google Friend Connect! I follow the Silhouette blog & Silhouette Pinterest. I’m already a follower of the Silhouette blog. Would love to win one of these Cameos. Thanks for the giveaway. I pinned your Hybiscus pillow! I also pined the pillow. So cute! I follow both you and Silhouette on pinterest. I pinned the adorable peacock shirt to pinterest. Hoping I get a chance to make it! I love the blog! I am now following on Pinterest. I pinned an the peacock transfer! Hope I win so I can make one! I follow them both on Pinterest and their blog!! I follow on Silhouette’s blog, thanks for the chance to win. I follow them on FB and Pinterest! ha ha I love Silhouette, but I just don’t have one yet!! I follow Silhouette on Pinterest & their blog:) Horayy for an amazing giveaway! 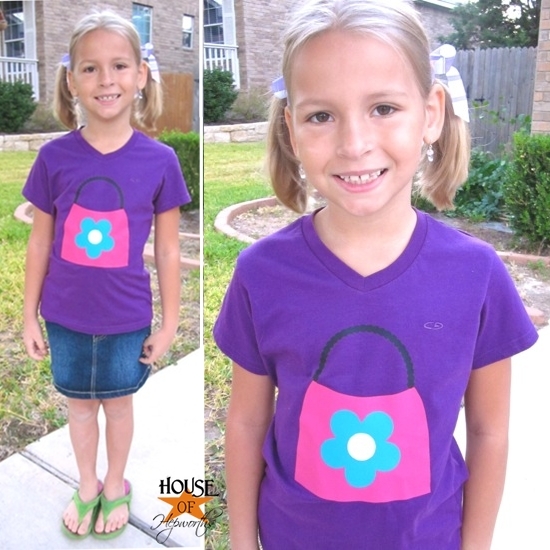 I pinned about Kinsey’s cute peacock shirt and the piano bags on Pinterest! I follow on facebook and pinterest and I pinned the cute shirts! I follow their blog. I am reluctant to join Pintrest though as I think I might get lost in cyberspace forever! I follow Silhouette on Pinterest and their blog on Google Reader, thanks for the giveaway!! Cutie! Those shirts turned out so well, love them. I follow the Silhouette blog! I follow Silhouette on Pinterest. Thanks for the chance to win! I pinned the peacock shirt on Pinterest. So cute! I follow Silhouette on Pinterest! Would love one of these machines. LOVE. I pinned your peacock shirt — it’s so cute!! I started following Sihouette America on Pinterest. I pinned and followed! I want one of these SO bad!!! I follow Silhouette on Pinterest. Thanks for hosting this awesome giveaway! I follow Silhouette on Pinterest and I follow their blog! I really hope to win one of these! Thank you for the chance! 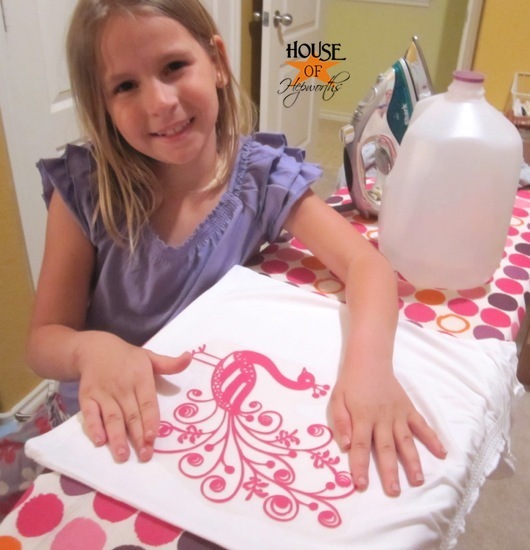 I pinned the cute swirly pink heat transfer picture to my pintrest boards. Follow you on Pinerest! Great job on the heat transfer! Adorable!! Thanks for the great tutorial on using the heat vinyl. I have been wanting to do this but, have been afraid to!! I would LOVE a silhouette!! I pinned your teal hibiscus pillows! I pinned an image to my Pinterest! I follow them on pintrest. LOVE IT!! I pinned the piano bag. I love it! My girls are using the same books as you daughter (here in AZ) we must have good teachers. Thanks!! I’m following them on Pinterest now, so many great ideas! Thanks so much! Wow I love your heat transfer projects. I hope I win your giveaway so I can make some projects of my own. I will be following you on Pinterest for ideas. Thanks for sharing! I just followed on Pinterst! Who knew all the things a Cameo could do! Thanks for the chance at this giveaway…I need one of these things so bad for my furniture fabric combos! I love your projects! I hope I win the giveaway so I can make some of my own. I will be following you on Pinterest to some ideas. Thanks for sharing. I love your projects! I hope I win the giveaway so zi can make some of my own. I will follow you on pinterest for project ideas. Thanks for sharing! Just updated my pins! Thanks for your inspiration. I am determined to own AND learn how to use the Cameo…. someday!! Oh! It looks so cool. I ‘m following them on pintrest. Oh my! I would *love* to win this!!! Really, seriously *love*!~! My kiddos and I could really go to town making all manner of cuteness! I pinned from this post. THanks for the fabulous giveaway! I follow Silhouette’s blog and their Pinterest boards. I love your blog, would love to win a silhouette! I pinned your awesome Hibiscus pillow! Love it!!! I follow Silhouette on Pinterest. It makes me want one more and more! 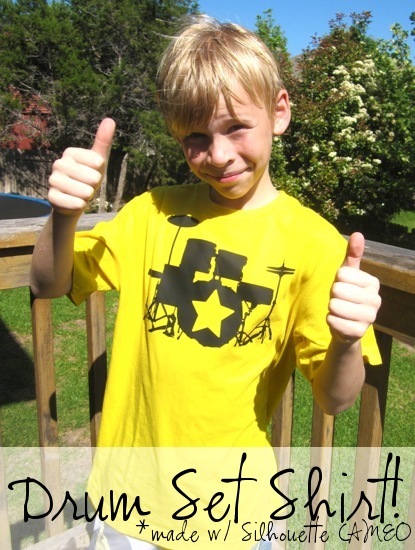 I pinned your drum shirt- my son would LOVE one! Followed you and silhouette on pinterest! I pinned the pillow, love it. I follow the Silhouette blog and follow them on Pinterest, too! I follow Silhouette’s blog…and yours:) Thanks for this chance! I pinned a photo of the Silhouette system on my Products I love board. It looks like a lot of fun. I follow Silhouette on Pintrest and their blog! I already follow Silhouette’s blog via Google Reader! Fun stuff! I pinned your cute hibiscus pillows on Pinterest! I also Like you on Facebook! Fun sense of humor! I follow Silhouette on their blog and Pinterest. Thanks for the chance to win! I pinned the piano bags! They are so cute and remind of my childhood days lugging my books to piano lessons. I follow Silhouette’s blog! and Pinterest! i follow silhouette on their blog! count me in please! i follow silhouette on their blog! count me in please!!! I pinned one of your projects onto my Kids Crafts board on Pinterest. I pinned an image to my Crafts board on Pinterest! I am following both the blog and Pinterest! I follow them on their blog. I follow Silhouette on Pinterest and the blog! Just pinned the peacock outfit! I follow Silhouette on thier blog and Pinterest. I pinned that hibiscus pillow! Love it! I follow Silhouette on Pinterest and on their blog with GFC. I follow the silhouette blog and follow them on pinterest. Thanks for hosting the giveaway! I follow Silhouette on Pinterest and their blog via Google Reader! Love the peacock t-shirt – so cute! I’m follow both the blog and pintrest! I pinned your butterfly bag!! Thanks! I pinned the hibiscus pillow on Pinterest! I pinned about this giveaway on Pinterest! I’m following on pinterest! Awesome stuff! I pinned the image of the peacock on the transfer sheet onto my Craft Ideas board on Pinterest. I follow Silhouette on pinterest and their blog! Just call me…a stalker! …and I pinned this too! This thing would probably change my life. I pinned the picture of the pillow with the flower on it – such a great idea for a boring sofa!! Thanks for the chance to win this! Hi! I follow Silhouette on Pinterest. Thanks for the giveaway and good luck everyone! 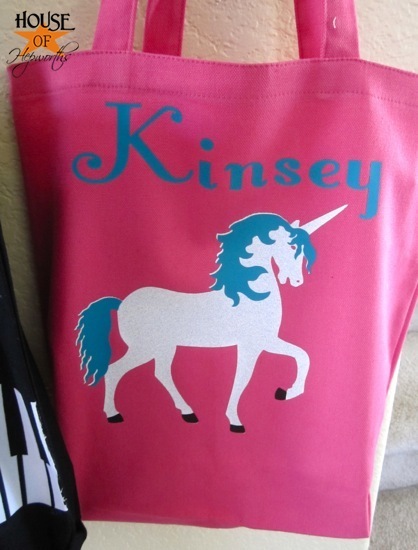 I pinned Kinsey’s unicorn bag on Pinterest. My dd wants me to make one for her. 🙂 Thanks! I followed Silhouette on their blog. Loved your projects. I think the peacock is my favorite. Super cute. I follow Silhouette on their blog. I follow Silhouette on Pinterest as well as follow their blog. I posted this page to Pinterest and am following your blog….Sooooo Excited!!!! I follow Silhouette and woul;d be the happiest crafter if I won the Cameo!! I follow Silhoutte blog and on PInterest. 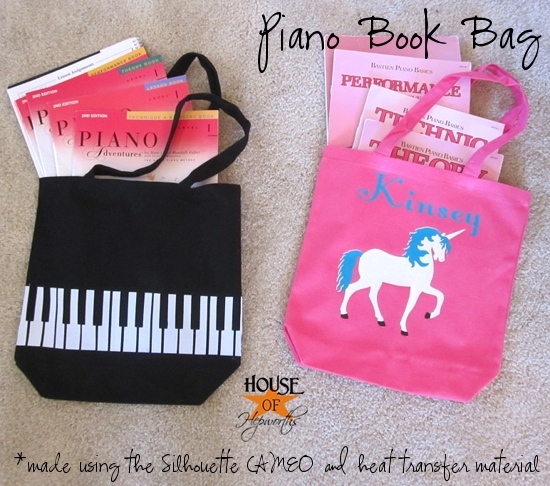 I’ve repined your piano book bags…they are adorable!! I’m following Silhouette on Pinterest and love the ideas…. I am following you and Silhouette on Pinterest! I follow both Silhouette’s Pinterest boards and their blog! I pinned the Piano bags to Pinterest! I’m a Silhouette follower on Pinterest! I pinned a photo from this post! I pinned your post and I follow Silhouette on their blog! I love the shirts and so want one of these to make all these cute things that I see everyone doing! Thanks for giving us the opportunity to win! I love the unicorn bag, adorable! It’s funny, I was thinking of what I could make with the heat transfers and I remembered I bought a lot of fabric to make tote bags and this is what I would do! I follow Silhouette on pinterest! and see so many things I want to do but need one first!! I follow silhouette on their blog. Love the peacock and piano bag. So many possibilities with the cameo. Im still following on Pinterest. Thanks for the chance to win. I’m pinning and following! I would love a silhouette! Thanks for the giveaway! I follow the Silhouette blog and Silhouette on Pinterest. I just pinned your hibiscus pillow to one of my Pinterest boards. I pinned a pic from this page! I pinned your cute pillows on Pinterest! I love you, and now I’m following Silhouette, too! I pinned that *fabulous* peacock tee on Pinterest! You’re making me lose my mind with all the stuff I want to do! I pinned the Silhouette Machine from your blog on Pinterest! follow silhouette on pinterest and their blog. I follow Silhouette on my RSS feed and Pinterest!! I pinned your logo on my pinterest! Now everyone will love you too!! I follow silhouette on pinterest & on their blog. I “Pin”ed an image from this post on my Pinterest. Thanks for a chance to win the best scrap tool ever! The peacock shirt is too cute! I repined the photo on interest. I also started to follow the silhouette blog. I have a cricut now but have heard amazing things about the silouette, I want to trade my cricut in! I’m following Silhouette on Pinterest now. Thanks for the tip! I love the practical suggestions you give on your blog!!! I follow Silhouette on Pinterest! Thanks for the great giveaway! I follow them on my Mac reader. Thanks!!! I follow Silouette on Pinterest! Following Silhouette on Pinterest and on their blog…What a GREAT giveaway!!! The possibilities are endless!!! I of course follow Silhouette on Pinterest. Love their ideas! Thanks for the giveaway! I pinned the cute peacock shirt on pinterest! I pinned the adorable pillow on Pinterest. 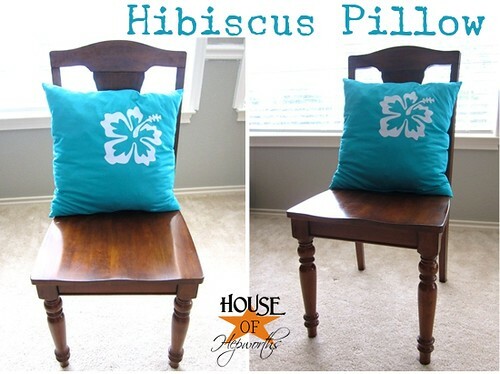 I pinned the picture of your Hibiscus pillows on Pinterest! If I win the Cameo I will make these in a heartbeat!!! I follow Silhouette on Pinterest. Found your blog recently and LOVE it! I pinned those very darn cute Hibiscus pillows! I pinned the cute pillow tutorial! I would love to make some of those with the Silhouette! I followed them on their blog! I pinned the peacock image! Wow, that was a close one! I had just ordered a Cameo last night from Amazon, but I cancelled my order so I can try to win one – or at least order the bundle if I don’t ;). I just followed them on pinterest! I pinned the cool drummer shirt :)! I have pinned the peacock design onto my Silhouette board on Pinterest. Thank you for the additional entry! I follow them on their blog! I also pinned an image on this post for the Silhouette! I pinned the picture of the hibiscus flower pillow! Hi! I’d soo love to win this! I follow Silhouette on Pinterest and their blog! I also pinned your cute peacock shirt on pinterest! I am OBSESSED with the Silhouette CAMEO! I have had one on my wish list every since I first saw one, but there always seems to be too many “needs” ahead of my “want”. To win this would put me in HEAVEN!! PICK ME!! PRETTY PLEASE!! I follow through Pinterest and Sugardoodle. The first project I would make are matching T-Shirts for our family reunion! I am OBSESSED with the Silhouette CAMEO! I have had one on my wish list every since I first saw one, but there always seems to be too many “needs” ahead of my “want”. To win this would put me in HEAVEN!! PICK ME!! PRETTY PLEASE!! I follow through Pinterest and Sugardoodle. The first thing I would make are matching T-shirts for our family reunion! I’m following you on pinterest and loving it! I follow Sihlouette on Pinterest! I follow Silhouette through Pinterest! I follow Silhouette through their blog, too! Thanks for sharing your great ideas. I pinned Silhouette on pinterest.